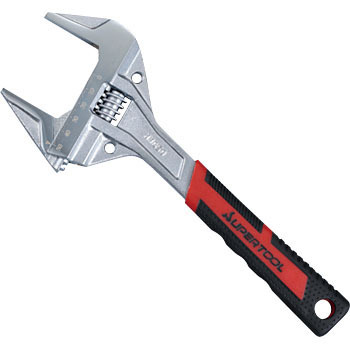 It is a very handy tool to tighten a large nut of a small place size and loosen. The tip thickness is also a product that corresponds to a thin nut with 7.5 mm unlike regular items. This review is about item#57862646. I used to use it until now because the play was coming, so I tried to purchase it is 0 to 5 cm wide, wide enough, quite satisfying with making solid. I tried using the UF pipe I bought at the same time to replace it, but there was no problem. Although it is big, I have difficulty in tooling, but I have trouble if I do not have one. Tightening bolt nut? High altitude work. Round holes in the terminal part of the handle are open only to black and red covers. Since the metal part of the main body is cut in the U shape, it is dangerous when the cover is cracked or it drops out by attaching the fall prevention to this hole. Other than that, it is an ordinary monkey. It is lightweight and also satisfies the large caliber that also holds the large mouth nut. Development of a plastic spacer made of plastics will be awaited for use when you want to avoid scratching, such as faucet equipment. It is light and easy to use and is saved. I used it to replace the cartridge in the tap. It was good as it did not have to ask a professional dealer around the water.